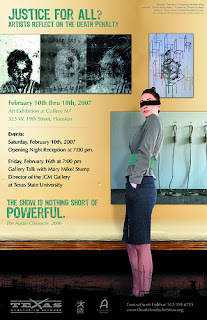 The death penalty art show will be exhibited in Houston at Gallery M2 from February 10 – 18, 2007 with an opening night reception at 7 PM on the 10th. There will be a gallery talk Friday, Feb 16, at 7 PM with Mary Mikel Stump, Gallery Director of the JCM gallery at Texas State University. We’ll be there. Thanks for posting this.